The cover is out. The book follows in January 2016. The cover indicates the starting point of the book, which is travel. What we do with our mobile devices reproduces what by now are common, ubiquitous, and habitual practices. To immerse yourself in sound and screen-based digital devices makes the journey go faster, provides opportunities to catch up, shields us from surrounding distractions, provides time to restore, and prepares us for whatever awaits at the end of the journey. 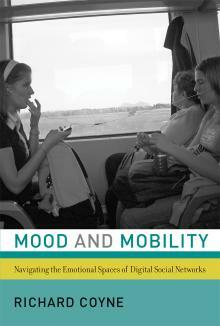 But we also receive, modify, intensify, and transmit moods via these media. Device-equipped travellers participate in a kind of shared digital mood modification. Congratulations on the new book! New inspiration for all of us!